Lighting was added to the hearth and inside the storage voids. The other day, I had to drop my car at the tire shop and because I had a few minutes to spare, I walked across the busy street to some stores. As always, I was drawn to one of my favorite stores, Lowe’s Home Improvement, and I found myself standing in the outdoor lighting aisle. If I go to Lowe’s, I almost always want to at least walk down some of my favorite aisles to see if there is anything new on the shelf. This day was no exception. I should back up a bit and say that whenever I build any type of structure in a backyard, whether it is an outdoor fireplace or outdoor kitchen, I always look for ways to spice up the final look. 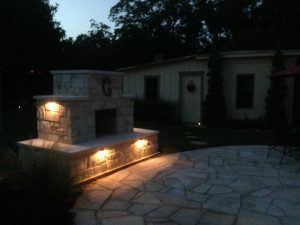 One of the things that I have written on in the past is my love for outdoor lighting. It just makes a backyard, and specifically, outdoor structures, come alive at night. The shadows created and the way things look in the dark with some light are just awesome. 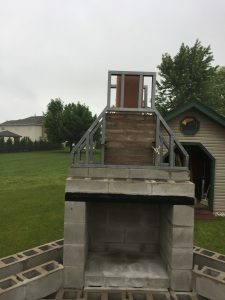 Lighting was added above the firebox. So, back to Lowe’s and the outdoor lighting aisle… In the past, if I needed lighting, I have just gone to the store and picked up what I needed to complete the lighting project. 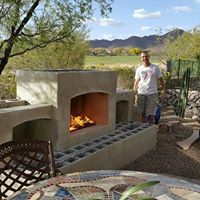 I have never shared with my audience how inexpensive it really is to add this great feature to your DIY outdoor fireplace or outdoor kitchen. Well, wait no more. Here we go. This DIYer added lighting to the hearth and the sides of the fireplace. 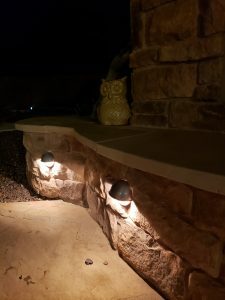 With most outdoor lighting, there are three main components involved. They are a power source, otherwise known as a power transformer, wire, and the lights. The transformer is a heavy cube that plugs into an outlet. Many of these transformers will turn on at dusk with photo eye technology and you simply tell it through a setting, how long you want the lights to stay on from that point. Pretty cool! 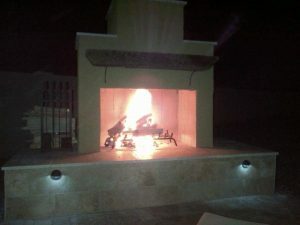 Four lights were added to this curved hearth. The neat part is the lights will come on automatically and shut off automatically; no work for you. They come in different wattage’s starting from around 60W to several hundred watts. For powering a structure, the smallest will be completely sufficient, especially if you’re using LEDs. A 60W transformer will sell for around $50. The wire will hook into the transformer with screws and the wire will snake through your structure’s block work. We’ll get into the install in a different post. The wire will transfer (Direct Current – DC) low voltage as the transformer’s output to the lights, so it won’t shock you any more than holding on to a flashlight battery. It’s nothing like the power from an outlet in your house. A 50’ length of this outdoor lighting wire will cost around $20. Lastly, the lights. Today’s technology has put LED lighting at the forefront for efficiency, longevity, and amazing power savings. LED stands for light emitting diode. An LED is a small electronic component (diode) that will glow when power is applied. No more changing incandescent bulbs, right? Can I get an amen on that one? 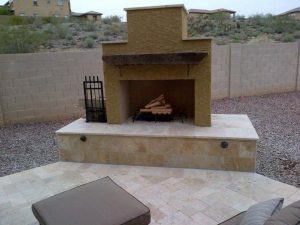 This Catalina fireplace had lighting added to the hearth for a great look. LED lighting fixtures are sold individually, and they can run anywhere from a few dollars on clearance to around $20 for each fixture. I add at least two LED fixtures to any structure, so it is aesthetically pleasing. Two is really all you need for a structure width of only six to eight feet. The LED fixtures will have power cord on them. This cord will connect to the wire and the connectors will pierce the wire to be powered. The best part is that each LED is around 2W to 4W so you could hook up to 30 of these 2W LEDs to a 60W transformer. Do you see the math? This is turning into an electronics training course now. 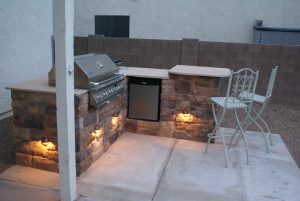 This DIY Tucson Grill design had lighting added around it for a finished look. How Cheap is It Really? 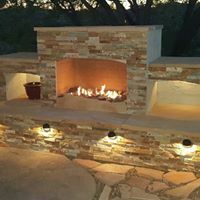 If you were to add two LED lighting fixtures to a fireplace, you would be able to spend as little as $110. Now that’s a bargain when you consider the look you’ll achieve. 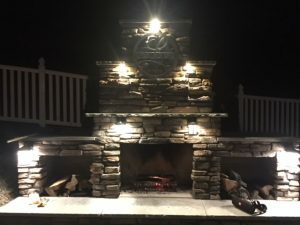 I hope this post helped you understand how simple outdoor lighting is and how inexpensive the components are. It’s really not that complicated. 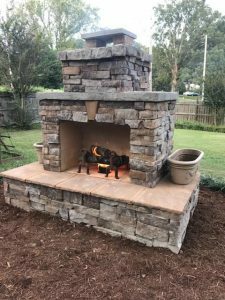 Check out Backyard Flare, LLC to learn more about building your own DIY outdoor fireplace or outdoor kitchen and peruse our gallery for great ideas in design. 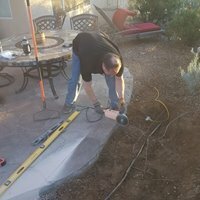 See what other homeowners have done. If you have any questions about anything, please let me know. 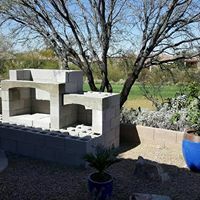 I am always excited to hear from a fellow DIYer, or someone wanting to learn more about how to beautify their backyard space. 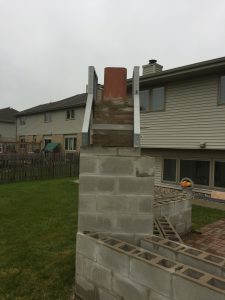 I can be reached at dan@backyardflare.com and as I always say, “Happy Building”. 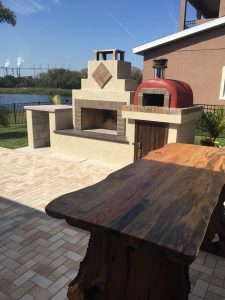 s. Husband and wife team, Marko and Kelly, were customers of Backyard Flare years ago and they built a stunning DIY outdoor fireplace and pizza oven combo when they lived in sunny Florida. 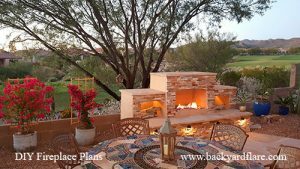 They used a Backyard Flare construction plan and the backyard was positively changed forever. 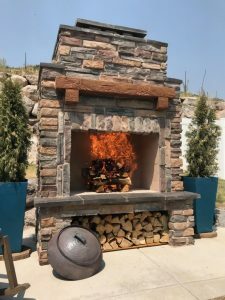 The structure drew lots of accolades from Backyard Flare followers and it was definitely a beautiful, one of a kind, fireplace. It’s easy to see why so many people were raving about it. It was so different than most. The red color on the oven adds so much to this design. 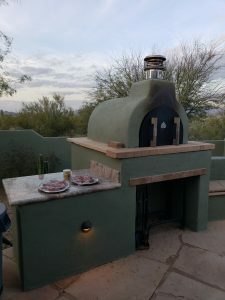 I have seen lots of pizza ovens and most are earth tone colors. 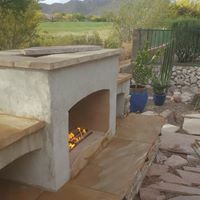 Marko and Kelly decided that a bold and deep reddish color would look great on their oven instead of keeping it like everyone else’s ovens. I have to say, I was impressed with the color choice. It worked so well with the surrounding area and it brought a pop of color not seen anywhere else in their yard. Coupled with the dark tones of the accent tile and the light color stucco, it was a hit. 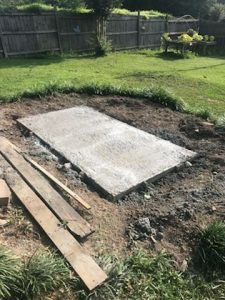 I’m sure it made a huge impact in the sale of their home, bringing in more money on the sale, than they would have had with a plain Jane backyard. Now fast forward a few years, with Marko and Kelly relocated to the great state of Utah. 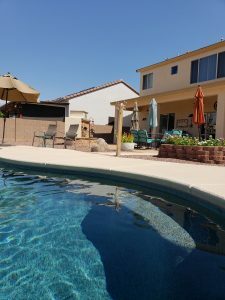 They bought a new home and needed to bring the backyard up to a standard they were used to. 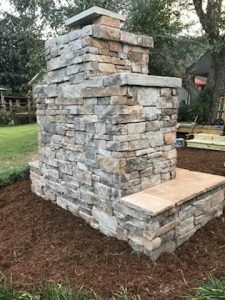 The new fireplace structure, although smaller than the Florida fireplace, is no less impressive. 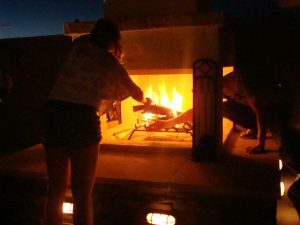 The fireplace sports a square topped firebox and an equally wide firewood storage void under the hearth. 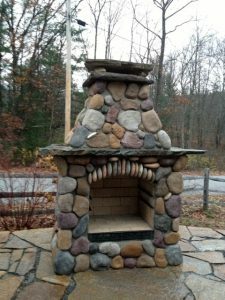 Natural stone is on the horizontal surfaces, including the top of the fireplace. 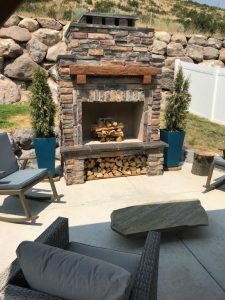 Keeping with the earth tone feel, Marko and Kelly added a wood mantel and a beautiful faux stone veneer. This fireplace sports a wood mantel and a firewood storage void. 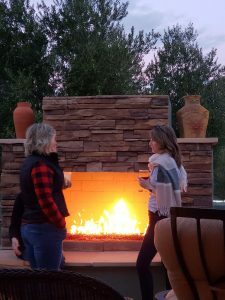 It’s not just the fireplace that brings the total feel to the backyard. 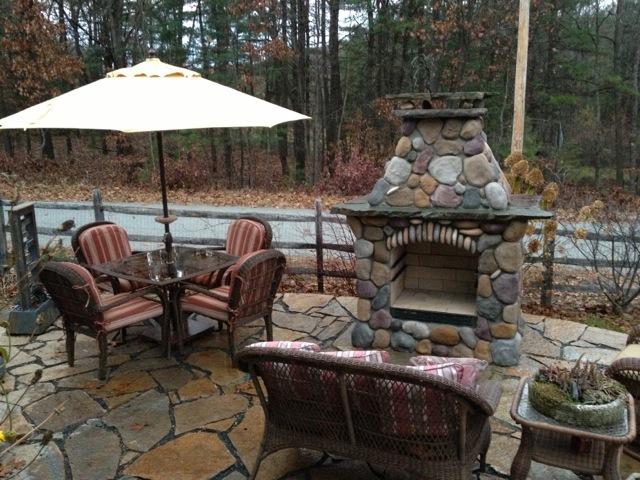 The natural flagstone table in front of the fireplace draws the earth tones to the patio. A huge pergola with a large outdoor table is the perfect place to have an outdoor dinner or just a place to sit and really relax. The white picket fence in the background with the bold green grass, adds contrast to the whole picture. 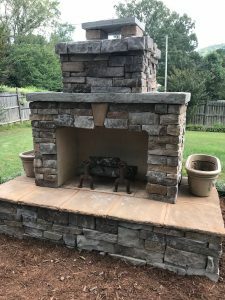 The large boulder wall behind the fireplace and the slight hill with natural vegetation adds to the rustic look as compared to the veneer on the fireplace. The bold color on the pots to the sides of the fireplace make the structure appear to be wider than it is. In action with a raging fire. 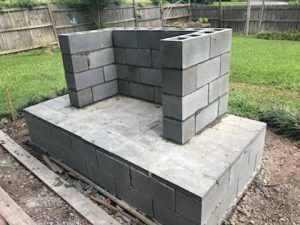 This is such a beautiful fireplace and I am sure this backyard will create lots of great memories. Great job Marko and Kelly. We are sure you will continue to enjoy your backyard paradise and we hope you will continue to share your fireplace with us. Special thanks to Marko and Kelly for sharing these great photos with us and allowing us to share them with the world. Also, thank you to all our faithful readers out there and to those who just found us. 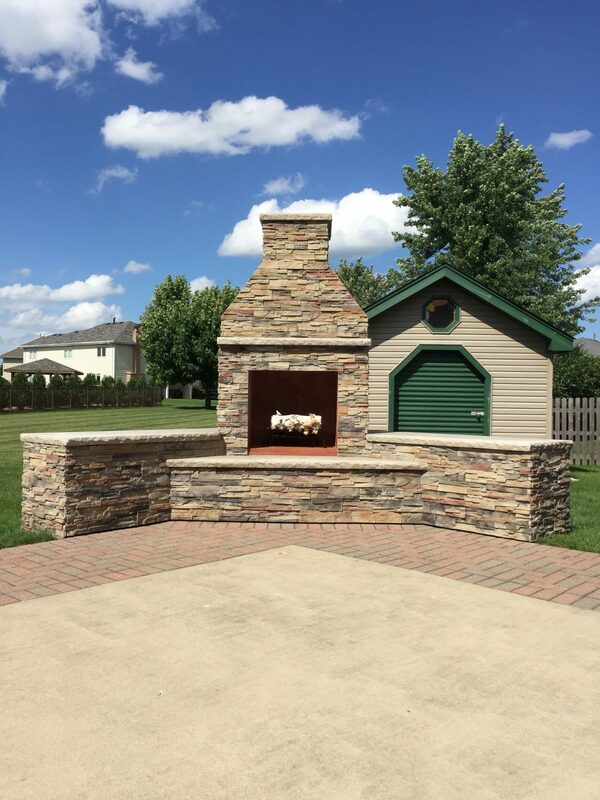 We can help you with your outdoor fireplace dream. 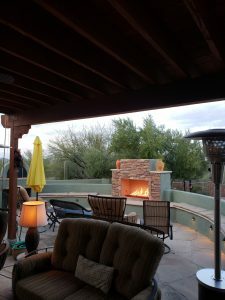 Visit our website at www.backyardflare.com for some great inspiration and fireplace ideas. Please follow us on Facebook and Instagram for lots of cool info and fun pics and video. Thanks for reading and as I always say…happy building. 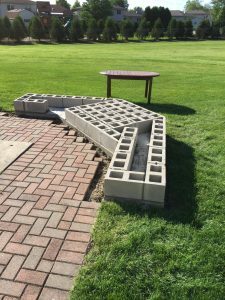 There are so many ways to make a beautiful backyard and so many different things to make it a ‘one of a kind’. 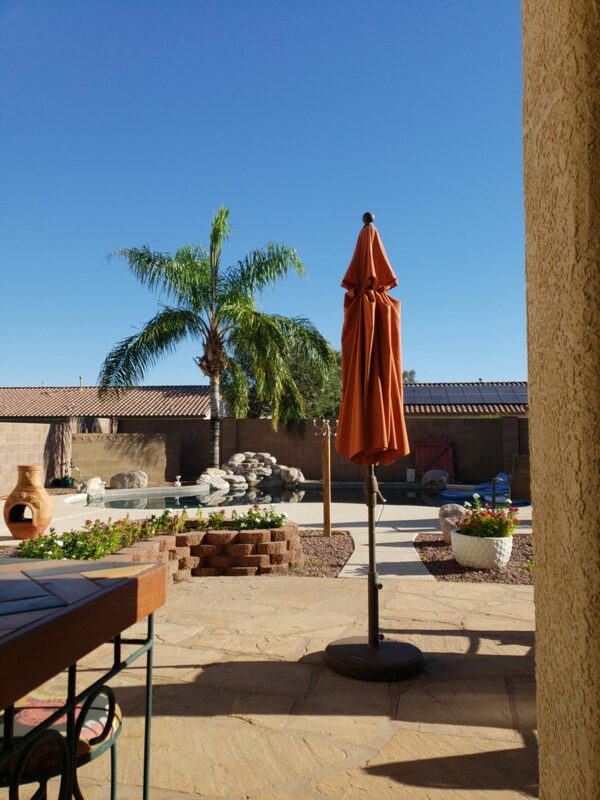 If a backyard was just a standard layout and everyone did the same thing, where would the fun be? 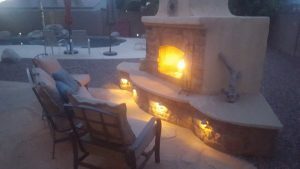 For as long as people have been living in houses, they have strived to create outdoor living spaces full of functionality and beauty. 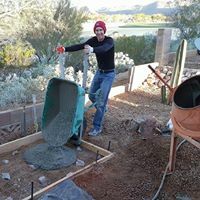 Backyard popularity and the drive to create the perfect outdoor space has always been there, and I feel the things to build, construct, and add are more abundant now than ever. So many options and so little time. 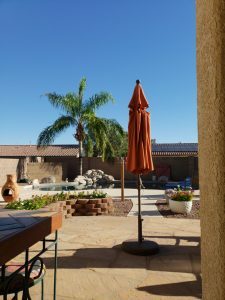 Here is Backyard Flare’s list of ‘Five Ways to Make a Beautiful Backyard’. 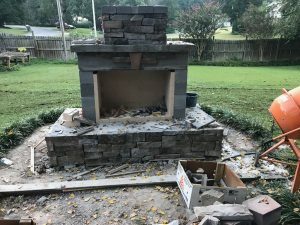 Outdoor fireplace with flagstone seating and stone veneer. 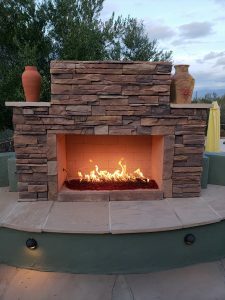 First and foremost, we love outdoor fireplaces and bang for your buck, they are amazing. They seem to be the one thing outdoors that will bring you a massive return on your investment. What you may spend a few hundred dollars on could gain thousands in return at time of sale. 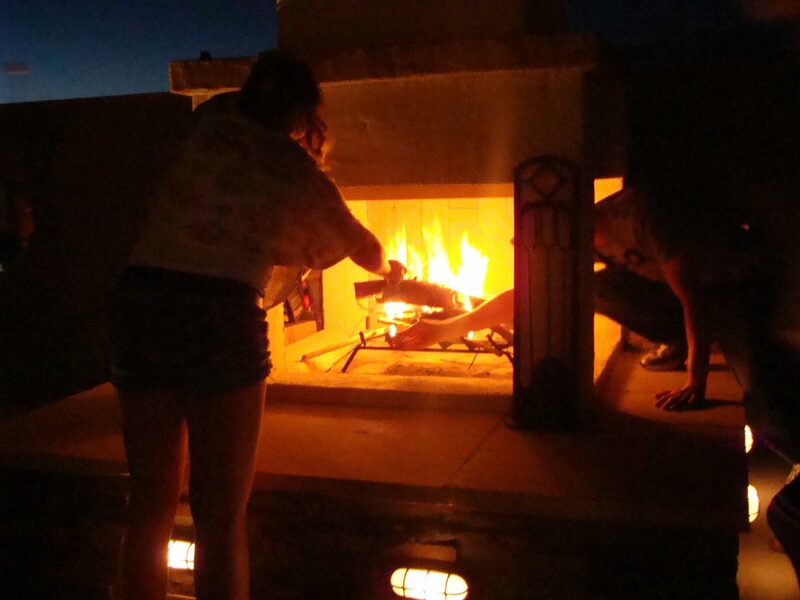 Outdoor fireplaces are our bread and butter and it’s what we think about day and night. 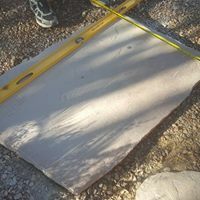 We are always talking to DIY homeowners about different layout possibilities and available building footprints. 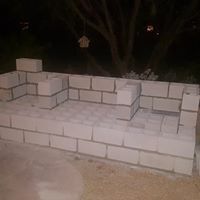 It seems like people are building fireplaces in spaces small and large. Even places that seem to not work for a fireplace, people seem to build in. Now, you don’t have to build a massive structure to have it be the focal point. 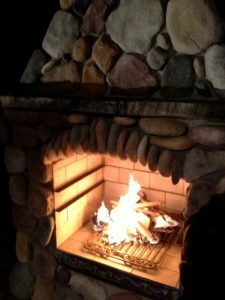 If you position your fireplace in a way that the flame is visible from inside your house, it becomes a very cool feature in that you can build a fire for ambiance. It’s so peaceful to have a fire crackling and you don’t even have to be sitting next to it to enjoy it. 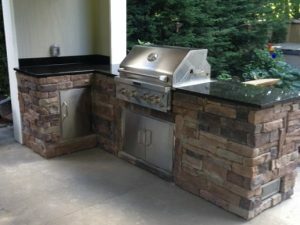 Outdoor kitchen with drop in grill and access doors. Holy cow, who doesn’t like to grill? I don’t know anyone right off the top of my head. 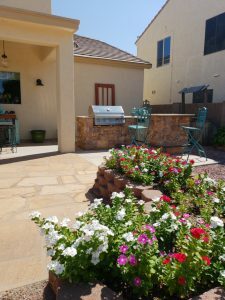 Most homeowners will have a small Weber grill or a cheap standalone grill on their back patio. Over time, it will probably be in a state of rust and full of cobwebs. It’s probably because the backyard wasn’t welcoming. It wasn’t a place where the homeowners wanted to spend their time. 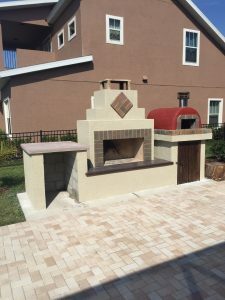 Ah, but build a nice outdoor kitchen and it becomes a destination… a “cooking” destination. 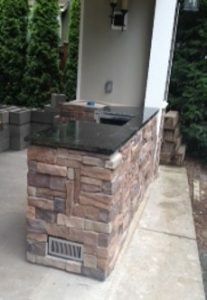 Outdoor kitchen with black granite countertop. pend on how much room you have to work with. The layout could be rectangular, built like an “L” shape, or even a “U” shape. 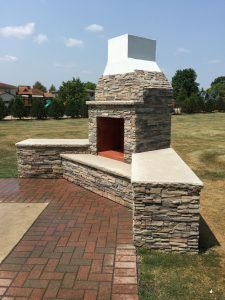 Drop in grills can be purchased for reasonable costs if you look around enough, and you can opt for propane or natural gas. 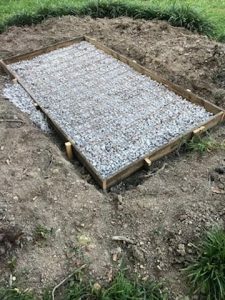 Building a sunken pit into your structure could even accommodate the use of charcoal, which in our opinion tastes wonderful. Spend some time looking into your backyard at night and think about where you would add low voltage lighting. Adding a transformer and some perimeter lights in the yard can add a lot of character. Upward lighting on trees and bushes can add visual depth that all but fades away at night. 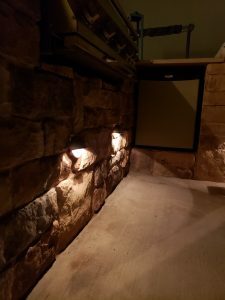 Lighting along the front of a fireplace hearth. 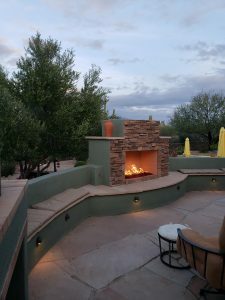 If you add the lighting to a structure such as a fireplace or outdoor kitchen, you will bring those structures to a focal point. 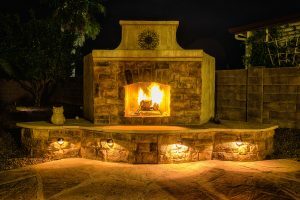 Many homeowners will incorporate lighting throughout their entire yard and through structures, having it illuminate all at the same time. This is a really elegant look. 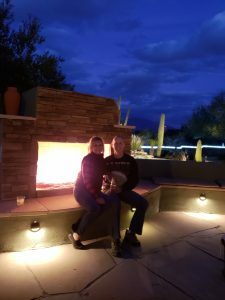 Lighting brings out the beauty at night on the outdoor kitchen. 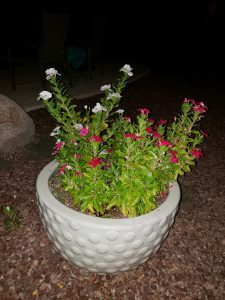 Colorful flowers in a white potted and textured pot. The right pot or three with colorful flowering plants puts the finishing touch on many backyards. The flowers provide a visual pop of color not usually found anywhere else in a backyard. With colorful pots or textured pots, you can add lots of cool looks. Change the flowers each season for different colors or type of plants. If you add a drip line into the pot, you’ll be able to minimize the maintenance time and possibly forgetting to water the plants. They don’t tend to live very long if they don’t get water. Comfy Adirondack chairs begging for usage. 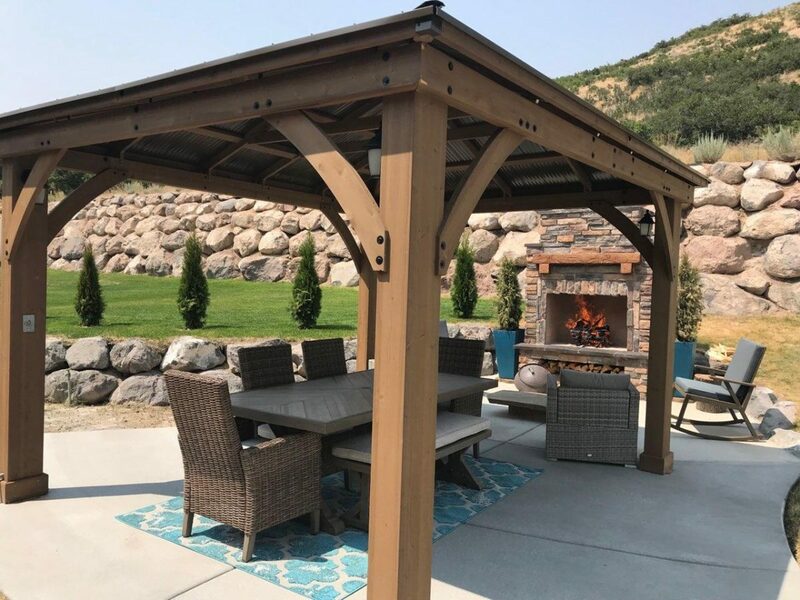 Last on our short list for a beautiful backyard but not even close to being the least important, add some shaded seating to your outdoor space. 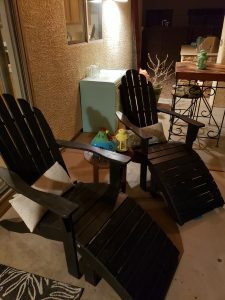 On cool mornings, I will grab a cup of coffee and sit in my Adirondack chair with my feet propped up. This chair lives under my patio cover, adding lots of protection from sun fading. When I want to venture out from the confines of the patio cover, I can relax in one of my teal colored padded chairs. The rectangular shaped glass table sports a teal colored umbrella providing great sun protection for most of the day. 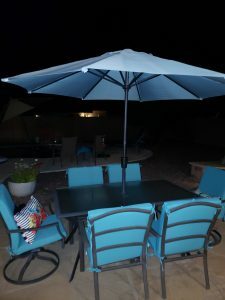 Teal padded chairs and umbrella around glass table. 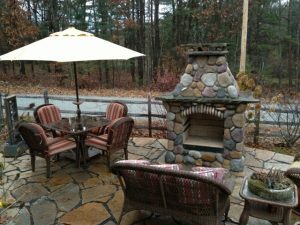 Just adding a few different places to sit comfortably in your backyard will offer the look of a welcoming area. 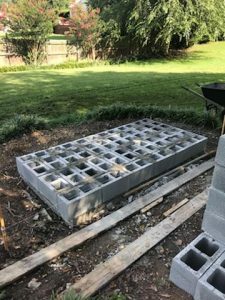 Over time, with these few things added or built in your backyard, you will have transformed your outdoor space and you will hopefully have a beautiful backyard that begs for usage. Lots of usage. And who knows, maybe you’ll add all five recommendations, completely renovating it to the envy of all your neighbors. 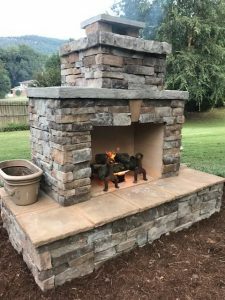 If you have any questions about any of the suggestions, or if you want to build an outdoor kitchen and/or outdoor fireplace, visit www.backyardflare.com. 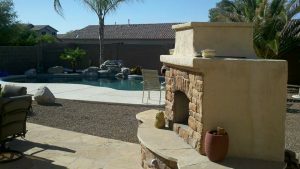 We’ll help you with your project and provide you with a very comprehensive DIY construction plan. Most if not all the guesswork will be gone.